A step above the traditional jobsite protection device, KNAACK® DataVault™ mobile provides a highly mobile jobsite connectivity solution, empowering productivity and digital collaboration. 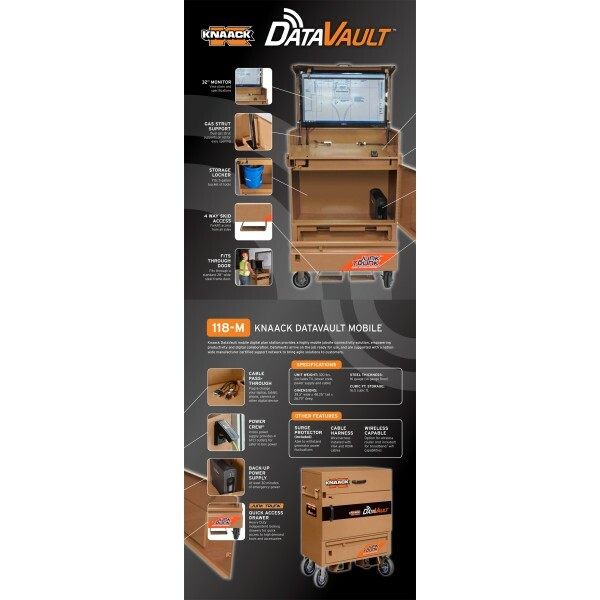 KNAACK® DataVault™ arrives on the job ready for use, and is supported with a nationwide manufacture certified support network to bring agile solutions to customers. After wheel casters are installed, 39.3 in long, 26.79 in wide, 48.25 in high. Power Crew® in box power supply provides 4 GFCI outlets for safer in-box power.